Those of you who are my friend on Facebook or follow The Magical Buffet on Twitter know that this past Sunday I got to see Anthony Bourdain from the television show “No Reservations” give a lecture and attend a meet and greet with the author/television personality. I wasn’t sure I was going to write about attending the event, but I’ve had so many people ask me what the event was like that I figured it would be easier to write about the whole experience here than to send out many, many emails. Seriously, you guys really want the Bourdain dish! Firstly, the turn out was insane! I couldn’t believe how many people showed up for this, especially assuming that most were like myself, and had no clue as to what was in store. The stage was empty except for a podium. I joked to my husband that Bourdain wouldn’t take the stage until his “hype man” came out to get the crowd warmed up. (Come on folks, get those asses up out of those seats!) In actuality, with no fanfare other than a disembodied voice saying “Anthony Bourdain”, he took the stage. And there he was. I paid a lot for our tickets, more than I have for any other tickets in my life. Part of the ticket price went towards getting to attend the meet and greet after the event (more on that later) but also for genuinely awesome seats. Best seats ever. Now I got to find out what the heck Bourdain does on stage. He opened up with the funny. Bourdain explained that he was backing off on picking on Rachael Ray. He found out that Ray is a fan of the New York Dolls and that she said nice stuff about him on television. Follow that up with a fruit basket and Bourdain decided that he was ready to let it go. This was a story that those who read his blog were already familiar with. He followed it up with the story of him getting inappropriately touched by Sandra Lee, again, something from his blog. The rest of the evening was a surprisingly honest and personal discussion. Having found out that the network he despises, The Food Network, has purchased the channel his show is on, he finds himself in the awkward position of not knowing if he can work for his former masters. (Bourdain’s first television show, “A Cook’s Tour”, was on the Food Network.) Does he stay, does he go? Is he selling out? What is selling out? Should it be something he does? Is it something he’s already done? The politics of eating. Organic, local, healthier, better. However, expensive, unattainable for many, guilt inspiring, and creator of fundamentalism. Everyone in the crowd got to watch Bourdain have a lively debate with probably the only person who really challenges him, himself. There was a question and answer at the end. Many of the questions are what you would expect. Where have you eaten in Albany? Answer, no where, although Chef Yono Purnomo of Yono’s fame provided food backstage. What places have you fallen in love with? Answer, Vietnam, Indonesia, and Colombia. Favorite NYC deli? Katz’s. What do you love to eat when you’re drunk? Followed by his guilt-ridden admission of loving Kentucky Fried Chicken’s Macaroni and Cheese. Advice to aspiring chefs, current chefs, home cooks. There were many people expressing gratitude for him visiting Albany, NY. Thanking him for inspiring them to cook, to travel, and to eat. All in all, an interesting and entertaining time. Now that it’s over, we’re looking at the meet and greet. I mentioned that our tickets were pricey. However, I felt better about the price of admission when I saw how great our seats were, knew that I was going to get to meet Anthony Bourdain, and when I saw what the meet and greet room was like. This wasn’t just a stand in line, get your book signed, and get out. There was coffee, desserts, beer, and wine. Tables were set up so you could mingle with other fans. It was a fantastic spread. Of course I couldn’t enjoy it until I faced my fear, speaking to Anthony Bourdain. So Jim and I got into line right away. While in line I glanced over and saw Chef Yono Purnomo standing to the side, unassuming and unnoticed. Although never having eaten at Yono’s, the reputation of the restaurant, and its Executive Chef, were enough to leave me star struck. Noticing my admiring gaze the Chef actually gave me a smile and a bow while I was in line. Then the room broke out in applause, Bourdain was in the building. He looked at the crowd of us with a mix of, holy crap, you all paid just to see me, and holy crap, I’m going to be signing books forever. However, the line moved quickly and soon enough I was standing in front of Anthony Bourdain, a writer who I admire immensely and fear. 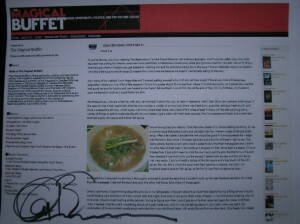 “This is a blog that I wrote for my website The Magical Buffet sir,” I started. Surprising myself that my voice was steady and calm. “Your love of pho inspired me to go out and find a place to try it. I liked it so much I wrote about it and dragged a bunch of friends out to try it.” He signed the print out I put in front of him, and said that was “Excellent.” I stood beside his chair for a photo, which unfortunately turned out blurry, and thanked him again. Then it was over.